5-CD box (LP-size) with 36-page book, 143 tracks. Playing time approx. 371 mns. We had so many requests to do a Carl Smith box, and once we started on it, we understood why. 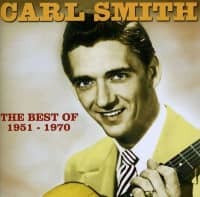 Carl Smith is the forgotten country superstar from the 1950s. All told, he had 40 charted hits, five of them getting to number 1. 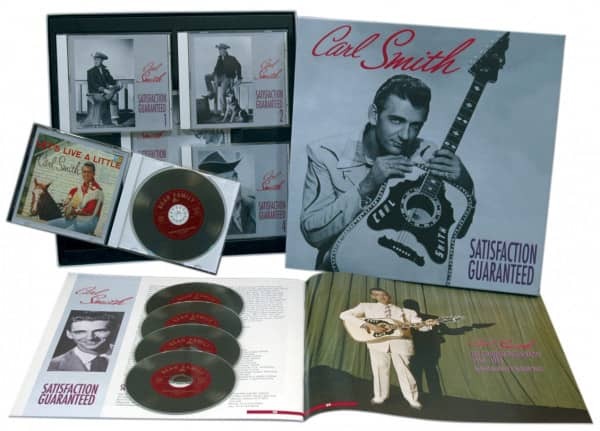 That's more than Hank and Lefty; in fact, Carl Smith ranks just behind Webb Pierce, Eddy Arnold, and Hank Snow as the major country hitmaker of the Fifties and early Sixties, made between 1950 and 1959. He didn't have a gimmick. He just found great songs, and sang them in a sincere and heartfelt way. This set includes all of his recordings from the Fifties. Hank Williams gave him a couple of songs to get him started, and Carl went on to record some great early compositions by Boudleaux and Felice Bryant, like Hey Joe and Back Up Buddy, as well as the original versions of I Overlooked An Orchid, Let Old Mother Nature Have Her Way, There She Goes, Let's Live A Little, and Loose Talk. He was the first to take the Louvins' 'Are You Teasing Me' into the charts. All told, there are 143 songs here. 37 Do I Like It? 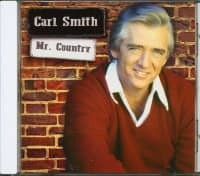 Of all the country music stars from the 'Golden Era' of the 1950s and 1960s, no star has faded from the public consciousness more than the great Carl Smith. 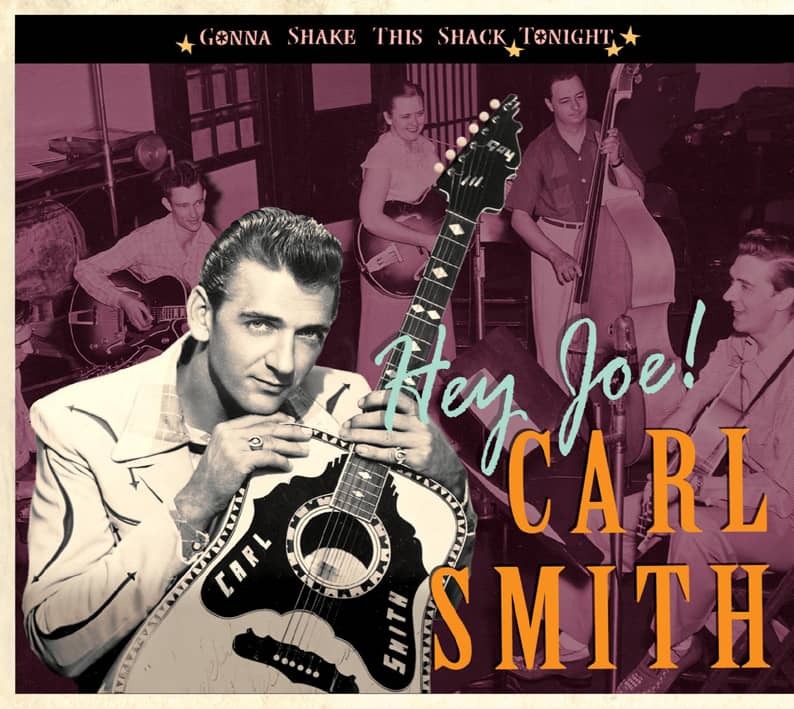 Although he possessed a fine voice, rugged good looks, a string of huge hits under his belt—not to mention his induction in the Country Music Hall Of Fame, Carl Smith is largely forgotten today. This compilation seeks to rectify that situation. Perhaps it is the insatiable demand for drama and tragedy that has led to the adulation for outlaws like Hank Williams, Johnny Cash, and Johnny Paycheck. In the case of Carl Smith, retiring to a 500-acre ranch south of Nashville does not make for juicy gossip, and may begin to explain why Smith is such an obscure figure today. 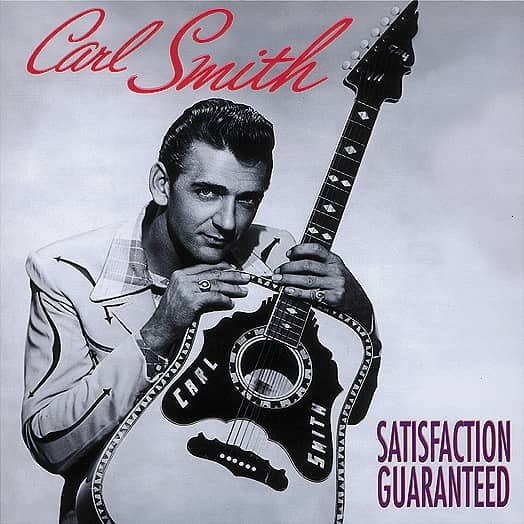 Carl Smith was born near Maynardville, Tennessee, on March 15, 1927. Growing up on the family farm, Smith was the youngest of eight children. Credit must be given to the determination of Smith's parents, Dock and Ina Monroe Smith—the first seven children were girls, but they wanted a boy. Another Maynardville resident, Roy Acuff, began making noise on Knoxville radio in the mid-1930s. Another future star, Chet Atkins, came from nearby Lutrell, and was also beginning to make a name for himself (playing with Bill Carlisle) over Knoxville radio. Young Carl Smith grew up listening to these men, and by the time he was ten years old, he got his first guitar. After taking guitar instruction through an outfit called 'Beale's Guitar Courses,' Smith was smitten with a desire to play music. Upon his return to Tennessee, Carl returned to his radio work, and soon began working with the most popular act in Knoxville at the time, Molly O'Day and her Cumberland Mountain Folks. Carl built up lots of experience with O'Day, playing rhythm guitar, upright bass, and singing. After O'Day and her husband gave up music to run a family grocery, Carl spent a year plagued with failure and self-doubt. The year of 1947 was spent returning to the family farm and planting tobacco, then traveling carpetbagger-style to Asheville, North Carolina; Wilmington, North Carolina; and Augusta, Georgia before returning once again to the family farm in Maynardville. Despite a December, 1947 recording date in Nashville with Molly O'Day, things looked bleak during this time for Carl Smith. Mid-1948 found O'Day and her group coming out of their short retirement, and they asked Carl to rejoin, an offer he eagerly accepted. Carl also began working with future 'Hee Haw' star Archie Campbell's group around the same time. It was a good time to be working in Knoxville, as the town was a hotbed of talent. The Louvin Brothers, Flatt and Scruggs, Maybelle Carter and The Carter Family and many others worked the Knoxville radio circuit, and all of them knew Carl and were impressed with his budding talent. Knoxville eventually became enough of a hotbed to attract Nashville talent scouts, and it was through a series of small, steady steps that a Dobro player named Speedy Krise and an A&R man named Troy Martin played crucial roles in Carl's big career break. George 'Speedy' Krise was the Dobro player in Archie Campbell's band, and was also a budding songwriter with a few minor hits under his belt. Speedy could write a good song, but he couldn't sing his own songs well enough to pitch them to major artists. As a result, Speedy hired Carl to sing on the demo acetate records of his songs. Troy Martin was a former recording artist who represented Peer-Southern publishing in Nashville. He'd formed an alliance with Don Law of Columbia Records to scout the hottest radio areas of the country looking for new talent. Martin came to Knoxville and was sufficiently impressed with Carl's voice that he took some of Krise's acetates back to Nashville with the intent of getting Carl a Columbia recording contract. Customer evaluation for "Satisfaction Guaranteed (5-CD)"